"Great things in business are never done by one person. They’re done by a team of people. -Steve Jobs"
Eric Speer joined DELTA |v| as an Associate Engineer in 2018. Before joining DELTA |v|, he was a Field Quality Engineering Intern at Nissan Motor Corporation and conducted biomechanical research at Vanderbilt. He chose DELTA |v| because of its culture of promoting the engineering discipline and its service to clients. Eric is excited to be working with and learning from a team of talented engineers with diverse backgrounds. He is constantly striving to increase innovation in the engineering profession while making a difference in the lives of clients through his analysis. 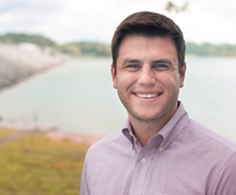 Even before his graduation from Vanderbilt University with his BS in Engineering, Eric was finding ways to positively impact the lives of those around him. His undergraduate senior design project—developing a shock tube that replicates an IED blast—was one such innovation. Not only did the lengthy design process yield a viable final design for his sponsors, but it could help shape future development of advanced protective equipment that could save the eyesight of service men and women exposed to an explosion. You will see a bit more of Eric’s naturally competitive nature outside of work. In his spare time, he enjoys spending time with friends and family playing board games, tennis, and golf. His favorite hobbies are water sports (slaloming and wakeboarding) and tennis. You may even catch him at a local concert or two.